The Céad Mile Fáilte greeting on this Irish welcome sign is a hundred thousand welcomes in Gaelic. This Irish welcome sign features the traditional Irish greeting of Céad Mile Fáilte and it could also serve as a door plaque. 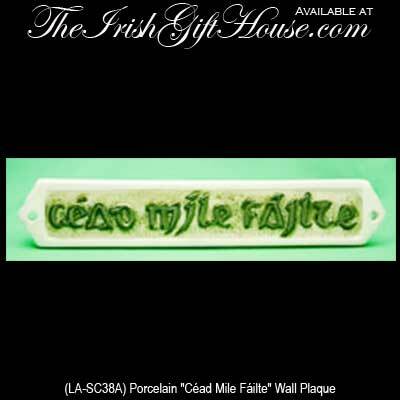 The white porcelain Céad Mile Fáilte door plate is enhanced with green accenting and it measures 9" wide x 1 3/4" tall. The Céad Mile Fáilte Irish welcome sign is complete with the mounting hardware and it is made in Ireland by Liffey Artefacts.